A CSU academic striving to improve the health of Aboriginal communities has been named the 2017 National NAIDOC Scholar of the Year. A Charles Sturt University (CSU) academic striving to improve the health of Aboriginal communities has been named the 2017 National NAIDOC Scholar of the Year. 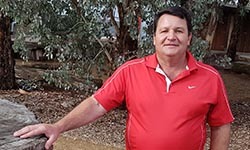 Dr James Charles is a podiatry lecturer in CSU's School of Community Health based in Albury, and is a Kaurna man from Adelaide, South Australia. Dr Charles is passionate about providing podiatry services to the Aboriginal and Torres Strait Islander community and believes that foot health is undervalued. He has worked for many years at leading universities, educating health professionals on providing culturally appropriate health care. A podiatry graduate from the University of South Australia, Dr Charles also completed his master's degree and PhD there. His research is published in peer review journals. "In my research for my PhD, I found that it was not just diabetes and smoking that caused poor foot health outcomes that results in the high rates of foot amputation among Aboriginal communities, but also the changing foot structure of Aboriginal people," Dr Charles said. "I am very proud and honored to win such a prestigious award. It is fantastic that the national NAIDOC community viewed my research as worthy. Most of all, it lets me know that I am on the right track with my work. "However, there is still a long way to go. I hope the award will shine a light on the poor foot health in the Aboriginal community and help me continue my research with other Aboriginal communities across Australia." In 2008 Dr Charles was the inaugural chair of the national Indigenous Allied Health Australia (IAHA), an organisation that he helped build.Always giving back to his community, Dr Charles has raised significant money for the Rotary Indigenous Health Fund to provide scholarships for Aboriginal and Torres Strait Islander students to study health degrees. For interviews with Dr James Charles in Albury, contact CSU Media.